Along with fly fishing, baseball is another passion of mine. Having followed the game since the late 50's, and becoming a diehard fan of the Red Sox in 1965. Over the course of those many seasons the Sox have kept me frustrated, energized, entertained, and finally gave me World Series championships. In the years that I've followed the "Game", and the "Bosox" many great players have taken positions on the fields of play, some honorably, and some not. I have a core of players who I believe are and were respectful of the "Game" A few players of my era...... Yaz, Fisk, Evans,...... Maris, Nettles, Munson,......Tiant, Palmer, Ford.... Jeter, Bernie Williams, Bob Gibson, and many more, who have played with honor. As we stepped onto the trolley, that would take us to the parking lot, I looked back at the "Hall" and said "Thanks" to those who Honored "The Game"
This is a favorite of mine, and I have fished it on small wild trout streams as well as larger rivers, with very good success. 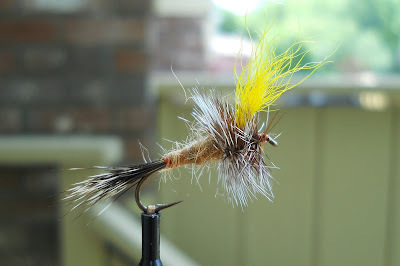 I tie them in sizes 14 and 16. 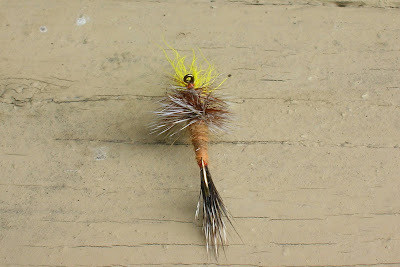 The other day I tied a few in a much larger size with the thought of fishing them in very fast and rough water. Yesterday I gave them a test. The flies were very visable and floated well in the rough water, the hits on the big guys were few, but when a fish did rise and take it "WOW" you knew there was a fish on. One of the Wulffs is in a trouts lip, the other alongside of a rock I guess. This big fly fast water thing is something I will do again. With the dry times we have been through over the last weeks, we in the last few days have recieved some rains. The stream in this post has been in my thoughts for the last few weeks and I have monitored the stream closely, and I'm happy to say it has come up some and its flow as well as its temps improving greatly. I walked this stream this morning and was very much excited with what I saw. The stream temps were between 60 and 64 degrees, with much better flows. 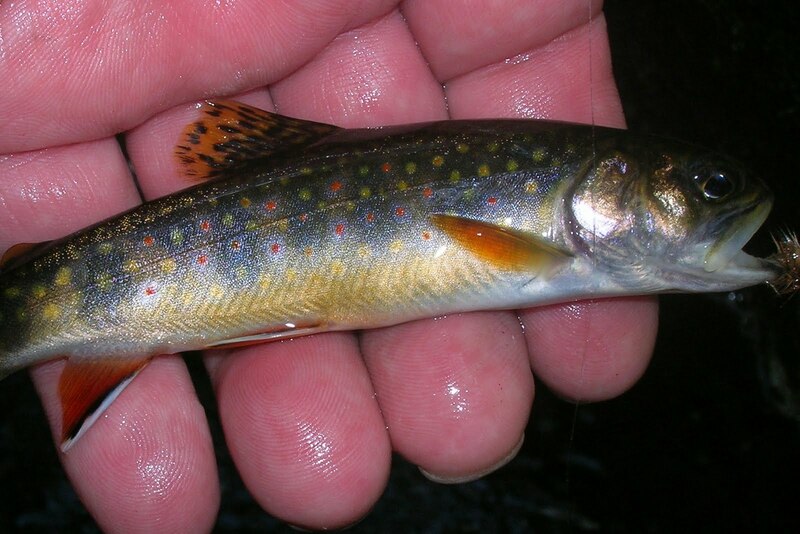 I again saw many juvenile brook trout, darting all over. In one pool I watched for several minutes the trout using the streams overhanging vegetation for protection as they moved along. I had my fly rod and dropped an Elk Hair Caddis into a deeper run, as it floated down it was soon swiped at by a fine healthy brook trout. When the fish came to hand, a quick photo and off he went. That was the only time a fly was drifted on that stream today. It rained all day today, and is raining with gusto as I write this blog. Perhaps the stream and its wild ones will be OK. These two bucktails have been my favorites in my quests for wild brook trout in small streams. The Edson Tiger, and Mickey Finn have managed to bring countless trout to hand. 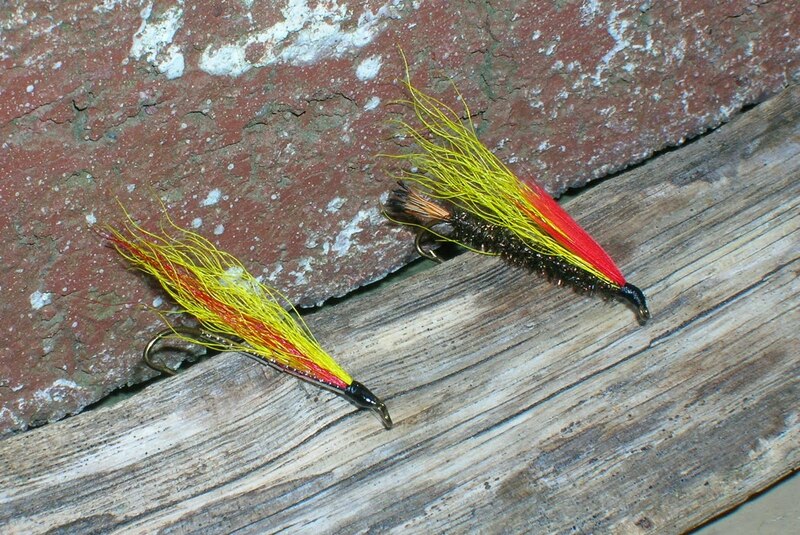 I believe the combination of yellow, and red to be a killer combination for brookies, but the bucktails have taken their share of wild browns. I fish these all year long, but the fall and winter have been best, perhaps its the times I fish them most. They are very easy to tie, requiring only a few materials. They can be fished in fast or slow water, stripped both up and downstream. I can recall a day in February, where the sun was out brightly and the noon temps were around 50. The wife sugested we take a walk along a stream in south central CT.
A stream that eventually works its way to the Connecticut River. 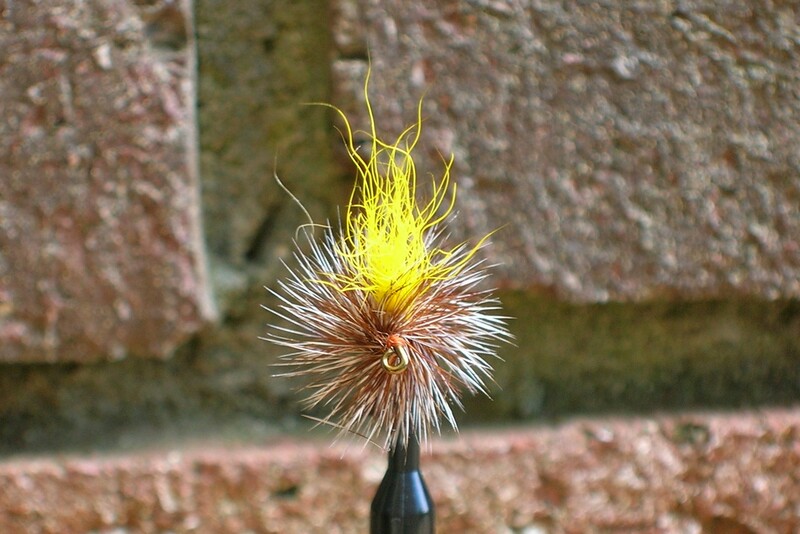 I had my fly rod rigged with a Mickey Finn, and as we were crossing a foot bridge I tossed the fly into the water. The current quickly swept it towards the bank about ten yards downstream. As I took hold of the line and started to retrieve, a fish rose in a swirl just behind the Mickey, a silvery figure of perhaps 20 inches, he could have eaten that fly but decieded to retreat back to his position in the stream. That spring I visited that same stream several times, unable to fish the same area because of swift water, I moved upstream where I could fish the stream better. The Mickey produced several browns, and a salmon smolt of generous size. These bucktails are worth the effort to try on any day. While we have been recieving rain, from Tstorms primarily, every little bit has helped. The little streams have been boosted somewhat and thats certainly welcomed. I am continuing to fish The Farmington River, which is nice and cool. 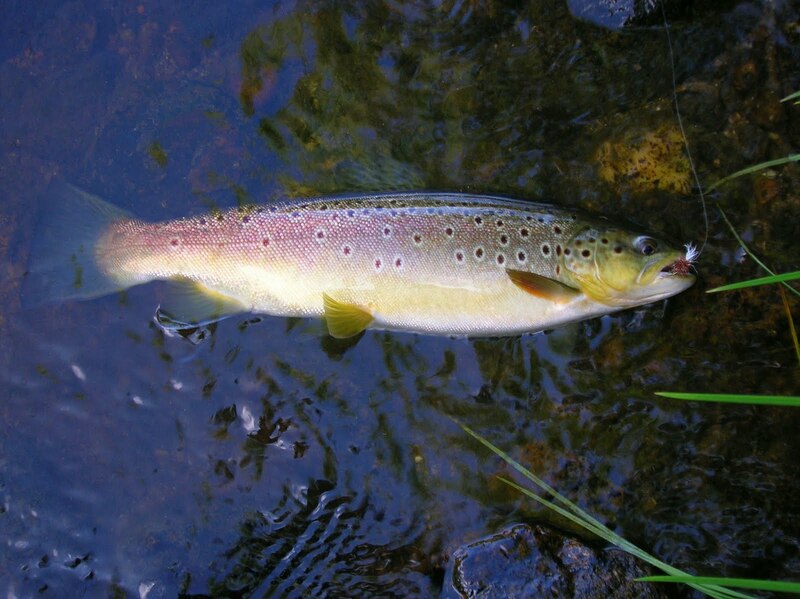 I have been doing well with the brown trout, using a Bomber, and BHPT's. If we should get some more rain in the next few days I may take a walk to a small stream and check the water temps, if suitable, I'll drop a Bomber. We have not had significant rain here in many weeks and it has taken a toll on the stream levels of many wild trout streams. I took a walk along one of them last Friday and here is what I saw. The levels were at the lowest I have seen on this stream. The water temps were at a very critical 68 degrees, and if it were not for the heavy leaf canopy, they would be at deadly temps. I observed the trout holding in the riffles to grasp as much oxygen as possible, they darted for cover as soon as I was noticed. Many of the undercut banks still provided safty. I noticed that the stream held many 3 to 5 inch trout, and a few larger ones observed. And something else showed itself in the low water, lots of crayfish. The need for rain is critical if this stream is to survive. Ever since my grandchildren have been able to they have sat down at my desk and started to tie flies. There first flies were a bit rough, but as they progress they have been better. We decieded it was time for there own desks and vise, I have a couple of Thompson's from years past which will serve them nicely. We put together a tool kit with the basics, and an assortment of threads, hooks, feathers, and hair, enough to get them going. I will build them a portable desk to do their tying, and they can take it home, and continue their creations. I have shown them the basics of locking in a hook, starting the thread, and a selection of some materials, and allowed them to create something a fish would eat. Perhaps this is something they will pursue and keep in their life. The weather over the last few weeks has been dry, and my beloved small streams, although cool are in need of some rain. Rather that stressing those little guys I decieded to fish the West Branch of the Farmington. Its a tailwater fishery with good flows and cool water. 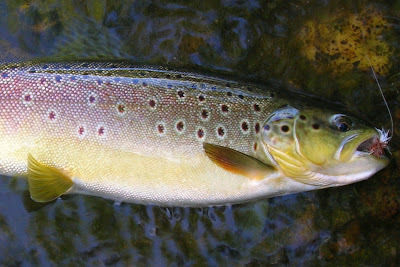 It produces insects like a factory, and has some fine trout, many of natural production. I'm not a hatch matching fly fisher, but instead fishing patterns that have worked well for me in the past. Flies such as Bombers, BH PT's, and a few streamers. If ever in the area the Farmington is a fine river to fish. Upcountry Fly Shop is a good stop before hitting the river, they will provide you up to date info to make your time more rewarding, along with a well stocked fly shop.